What is FileChimp and what does it do? I have installed FileChimp where do I find it? How do I unlock the Administrative features of FileChimp? How do I deploy the same configuration to multiple machines? We hope you find our FAQ useful, please help us to make the content better and ask us if your question is not answered here. Where can I file my emails? What format are the emails filed in? How many rules do I need to create? Can I change the file name template? Where are my email attachments filed? How many emails can I file at a time? Do Duplicate emails get filed? How to I know which emails have already been filed? Can I use shortcut keys / hot keys to file emails? How do I save old email to empty my mailbox? How does FileChimp know which folder to move the files into? Why use patterns instead of defining specific paths? Are there any limitations to the trial version? FileChimp has disappeared from the toolbar how do I get it back? How do I purchase FileChimp? My questions are not answered here where can I get help? FileChimp consists of an Outlook Addin and a taskbar application. I have installed FileChimp, where do I find it? You will locate the FileChimp for Outlook features on the main ribbon of Outlook. If you do not see it here there is a chance the addin has been disabled by Outlook, please refer to our troubleshooting section here or contact support to get you up and running. You will also find the FileChimp taskbar application running down near the time in the bottom right hand corner of your screen. You may need to click on the arrow to reveal the FileChimp logo. The Outlook addin is used from within Outlook to manually file single or multiple emails into network folders. You can configure your file name template to suit your filing structure. Emails are retained within Outlook (marked as filed) OR deleted as per your requirements. 1. Quickfile - Use Quickfile to file an email into the suggested folder location. Simply select one or many emails, note the suggested filing location and if it is correct hit Quickfile to complete the filing action. 2. File Selection - Use file selection when you are filing a single or multiple emails to a new location or a location which is not suggested by Quickfile. File Selection offers the user a choice of recently filed to locations and offers the user the ability to browse for a new location. 3. Folder filing - Use the folder export feature if you are looking to file all emails or all emails within a subfolder (and its folders) onto the network. FileChimp will export the emails and the folder structure as you see it in Outlook. How to Automate email filing with the FileChimp Application. The FileChimp taskbar application is the engine that is used to direct emails or files into the relevant network folder based on a generic rule. The concept is based on the understanding that an office has a typical filing strategy based on either project numbers, client names, tags, or user specified strings. You can file emails into any network or system folder that can be seen in windows explorer. This includes filing emails to flash drives or cloud storage folders such as Dropbox, One Drive, Google Drive, SharePoint and many others. You can also file emails into other Outlook folders or sub folders. By default, emails are saved in the ".msg" file format which is native to Microsoft Outlook. These emails can be previewed in Windows Explorer (Windows 7 onward), using any version of Microsoft Outlook, or any compatible viewer. FileChimp Pro users can save emails to PDF, MSG, DOC, HTML, EML, RTF and TXT formats. FileChimp rules are based on criteria. Typically one rule is created to define how you want to match files to folders. Yes. Go into the FileChimp Outlook addin settings (cog icon on the ribbon menu) and select 'File Name Template Options'. You can also change the order of the fields by moving items up or down the list. You can also alter the file name template for saving attachments independently to the file name template for saved emails. You might like to do this to include the senders domain name or email address as part of the file name. Simply add or remove any number of fields to construct the desired file name. You can batch file emails in one go by selecting the emails in Outlook using the Ctrl key or the Shift key before selecting the "File to Folder" icon on the FileChimp ribbon menu. No. Duplicates are avoided where the same file name template is in use. If you work in an office and have multiple users filing emails with FileChimp only 1 copy of each email will be stored. How do I know which emails have already been filed? Each email in Outlook is marked with an orange tick (or FileChimp Category mark) once it has been successfully filed into the file system. Can I use keyboard shortcuts or hotkeys to file emails? Yes. FileChimp allows you to select 2 keyboard shortcuts to call the Quick File and the File to Folder functions. Configure the keys you would like to use in the Outlook addin settings for FileChimp. Simply click in the relevant hotkey and then press the keyboard keys you wish to assign to this shortcut. By default, FileChimp retains the integrity of the email with attachments saved within each email. Simply open windows explorer at the desired filing location and re-open the message to view the message content and attachments as if you had opened them from Outlook itself. 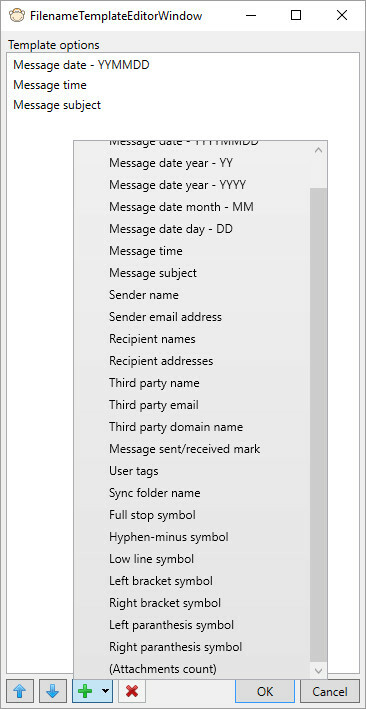 You can also enable seperate attachment handling within the Outlook Addin settings. Enabling this feature will not remove the attachments from saved emails but save a copy of the attachment into the specified auto save folder. You can also specify a different file name template for saved attachments which could be used by a taskbar application rule to move attachments to the correct network folder. Learn more here. In Microsoft Outlook select the email you wish to file, next select File to Folder from the FileChimp toolbar on the Outlook ribbon bar. You can batch select multiple emails for manual filing to specified locations OR you can configure FileChimp to process the email and file it according to the rule specified in that profile. To make FileChimp file historic email by rule simply select the relevant emails and use the right click context menu to 'Autosave selected item(s)'. Select the profile you would like the emails to be processed by and FileChimp will do the work, moving and marking the emails as filed as it successfully moves the emails to the correct destination folders. FileChimp monitors folders and subfolders in any given 'destination folder' and matches or partially matches this to your file name based on the pattern set in your rule. To correctly define a rule take a look here at some examples. Why use patterns instead of defining specific paths or using Outlook Rules? By using patterns to locate the destination folders you need only define a single rule to match files into current and future folders. Chances are the rule will not change but you can add folders/subfolders and new files matching these patterns will find their way to the folders without further action on your part. If you are familiar with Outlook Rules you would need to specify a rule for each project or client name you would want to match. No - the only limitation to the trial is the duration. Once the trial expiry date is reached FileChimp will stop processing files and the Outlook Addin will become inactive. It is possible that Outlook has disabled FileChimp or that FileChimp has been disabled by Outlook as another plugin has been disabled. 4. Place a check in the box next to FileChimp to re-enable the addin. 5. If FileChimp does not appear in the list go back to step 3 but select 'Disabled Items' from the dropdown and then repeat step 3 once more to enable FileChimp. You can purchase single licences direct from our website, if you require multiple licences please contact us. Please complete the contact form here - or give us a call on +44 1707818069. If you prefer to speak to a real person and would like us to call you back please leave a contact number. The Source and the Destination locations are CORRECT and EXIST. Take time to check each one manually, confirming its path and exact name. Please also refer to the troubleshooting steps contained in the user manual. Please check if you have Microsoft VSTO tools installed. You can download them here. Please review additional troubleshooting steps for disabled addins found in the User Manual here. How do I install FileChimp for multiple users? FileChimp is packaged in an MSI file which can be deployed by Group Policy, 3rd party deployment software or login script. How do I unlock the Administrative features (padlock icon in settings) of FileChimp? Any setting within FileChimp can be configured and locked by an Administrator. To learn how to do this please contact us for your administrator password. Deploying common settings to all computers can be achieved through the licence / by adding registry keys by group policy or directly in the admin user interface of each computer. To deploy Outlook addin settings using the admin UI to multiple computers please review this guide. To deploy taskbar application settings, Profiles and Rules using the admin UI please review this guide. To learn about the FileChimp configuration files click here.